Larry Krasner is the Democratic candidate for district attorney. His challenger, Beth Grossman, is running on the Republican ticket. On Nov. 7, Philadelphia will elect a new district attorney. The issues facing the D.A. 's Office — civil forfeiture, violent crime and guns, the role of the office in the opioid crisis, ethics and political corruption, and the influence of outside organizations — are, perhaps now more than ever, at the heart of Philadelphia public discourse. Our Editorial Boards sat down with both candidates last week to discuss these issues and others in preparation to make an endorsement. Will you stop using the proceeds from civil forfeiture as a line item in your budget? If so, where will you divert those funds? Larry Krasner: "The place where these proceeds should be is in education, it's in job training, it is in drug treatment, because this is actually a public health issue. It's not a criminal justice issue in many ways. And, frankly, I think it's a shame that they have been used as a slush fund by the D.A. 's Office for so long. Ideally, they wouldn't go into the D.A. 's Office at all. They would go into a more general fund. However, we have to use them for blight. If we're going to have them, we have to use them for blight rather than using them as they have been used, as a slush fund." Beth Grossman: "That's a very difficult question to answer due to certain litigation that is going on, but I think civil asset forfeiture funds could and should be used toward drug-prevention programs as well as crime-prevention programs as well as witness relocation efforts." What will you do — that hasn’t been done — to keep guns from flowing into Philadelphia? Larry Krasner: "There are so many layers to this. We need to go after gun shops that engage in dirty practices. We need to require people, as the law allows, to report when a gun is lost or stolen. We don't do that now, even though it's on the books and, frankly, it makes it much easier to sell guns on the street. We need to work closely with federal and state authorities to do everything we can to slow down the flow. We have a real problem here, but we need to do everything we can to slow down the flow." Beth Grossman: "I think you have to work and have very strong relationships with ATF and other law enforcement agencies as well as to focus on gun dealer shops where there seems to be a lot of activity [that] can be traced back to them or has a connection to violent crime. It's sort of a multipronged approach, as well as … prosecuting those who do commit violent crimes with guns … as well as possible legislation in the future." How will you change your approach to the opioid crisis to reflect the fact that people are increasingly trying to solve it as a health problem, not a criminal problem? Larry Krasner: "The answer is yes. It's a health problem that flows directly from for-profit decisions made by Big Pharma. This is a Big Pharma-induced national health crisis and other for-profit decisions that have been made by doctors and dentists and pharmacists and other people who are in the chain. We absolutely have to do something to address the fact that the 400 percent increase in pills in the last decade has led to what is increasingly a heroin problem. It starts at the top. You've got to start with Big Pharma." Beth Grossman: "It's both. It is a public health crisis … It's an illness. People are addicted. For those who get caught up in the criminal justice system for usage of it, I think you have to look at holistically, which must include treatment, with the understanding that recovery often includes a lot of relapses. That has to be taken into account. With regards to dealing, I would continue to go after those heavy-duty drug dealers, drug-trafficking organizations, as well as illegal pill mills." What innovations will you create to deal with local political corruption? 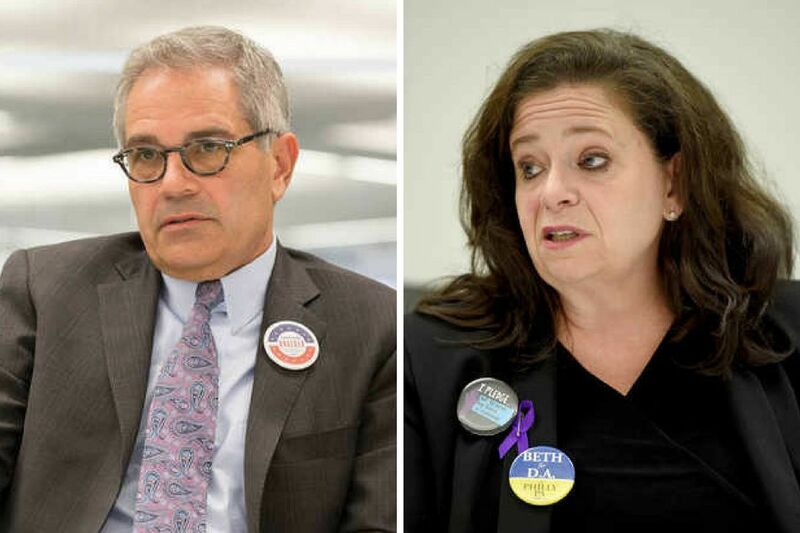 Larry Krasner: "It is my intent to have the default position be that all types of corruption would be addressed by the District Attorney's Office. Unless and until I can see a reason why it's ethically or legally not permitted, these cases should remain with the District Attorney's Office rather than being sent to other offices, where the motivations may be more political, frankly, than what it is I hope to see in this D.A. 's Office." Beth Grossman: "Simple: I will prosecute any public official, regardless of party affiliation, for public official crimes. When you're a public servant, you serve the public, not yourself." Would you allow an outside organization, such as Black Lives Matter or the Fraternal Order of Police, to influence your operation of the District Attorney’s Office? Larry Krasner: "No, there is no outside organization that influences what the District Attorney's Office does. The essence of the job is judgment and discretion and being even-handed, and that's what we intend to do." Beth Grossman: "No, the role of the district attorney is to uphold and enforce the law fairly, ethically, and within the confines of the Constitution and the laws of the Commonwealth of Pennsylvania. You are obligated to follow that — no other group."